Download the PDF version (396 KB) of this content. Western Canada's manufacturing industry employed just under 375,000 people in 2016. This is relatively small compared to manufacturing employment in Ontario and Quebec, which together make up nearly three-quarters of industry employment nationwide. Still, Western Canada is home to a diverse range of manufacturers, covering sub-industries such as wood, food, petroleum, machinery and metal products manufacturing. Over the next two years, western manufacturers should benefit from continued economic growth in the U.S., the region's largest export market. Manufacturers in the western provinces and territories will also have opportunities to diversify trade through free trade agreements with Asian and European nations. Once in effect, these agreements will help promote Western Canada's manufactured products overseas, and enhance growth prospects. Firmer crude oil prices have helped boost business confidence and spending. Manufacturing exporters are benefiting from a weaker Canadian dollar, which has helped to compensate for recent decline in economic activity tied to natural resources. On-going economic growth in the United States (U.S.) is generating demand for western Canadian manufactured products and increasing opportunities for manufacturers. The U.S. is Western Canada's top export destination; however, new protectionist policies present a downside risk in the near-term. To diversify trade, international free trade agreements will help reduce trade tariffs, and provide new opportunities around the world for manufacturers and exporters to sell their products. Low-interest rates are making it more affordable for Canadian manufacturers to receive financing for capital investment. New machinery and technology are essential to help improve productivity while keeping costs in check. 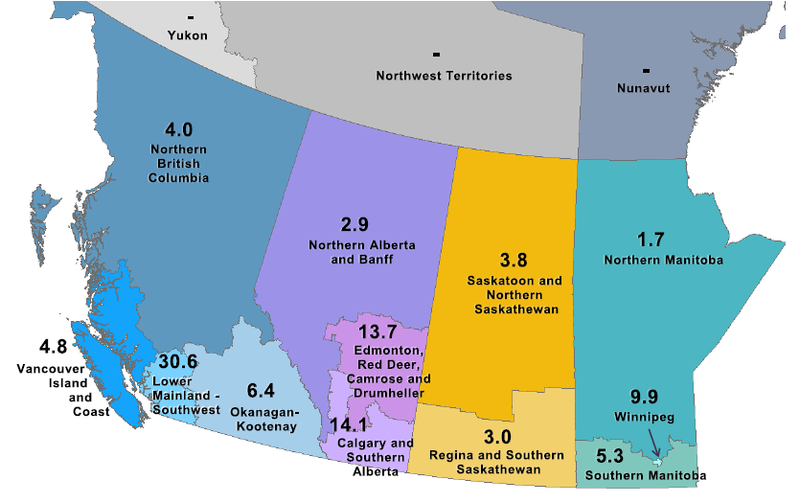 The four western provinces and three territories make up 22% of Canada's manufacturing employmentFootnote 1 and generate 18% of the country's total manufacturing exports.Footnote 2 Of the western provinces, British Columbia (BC) has the largest share of manufacturing employment, followed by Alberta, Manitoba and Saskatchewan. In terms of contributions to gross domestic product (GDP), manufacturing contributes significantly more in Manitoba (10%) than it does in the other western provinces (on average, 7%). In BC, the largest proportion of manufacturing employment (32,000) is concentrated in wood product manufacturing, which makes up 22% of total provincial exports.Footnote 3 The U.S. is the prime destination for nearly 70% of BC's wood products.Footnote 4 This raises significant concerns among provincial manufacturers regarding the recent protectionist bend in the U.S. BC is also home to many food manufacturing companies, mostly situated in the Lower Mainland area. Although manufacturing in the territories plays a minor role in terms of employment, export-wise, over half of Nunavut's exports come from manufacturing-based businesses. Within that, pharmaceuticals and seafood products made up 17% of Nunavut's total exports in 2016.Footnote 11 That same year, just 4% of Yukon's total exports included manufacturing.Footnote 12 In Northwest Territories, manufacturing contributed a mere 0.1% of total exports,Footnote 13 due in large part to the high concentration of mining, which generates most of the territory's export value. 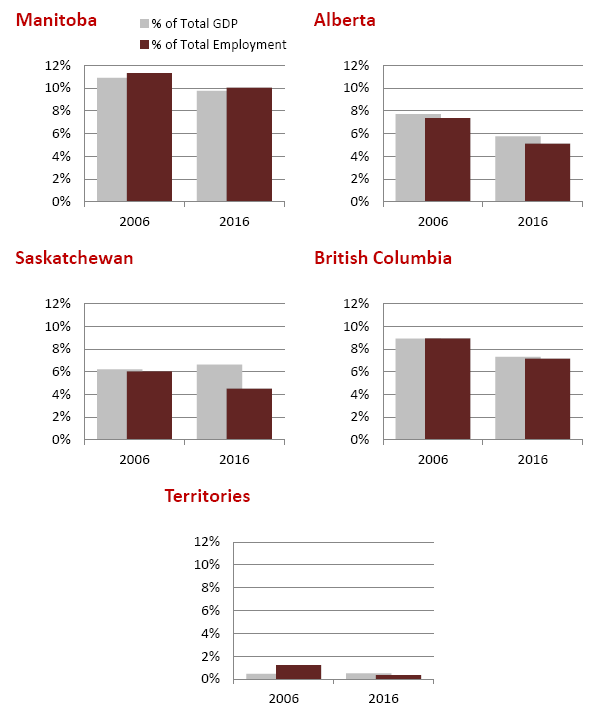 Manufacturing employment in Western Canada fell 7% between 2015 and 2016; Alberta shouldered most of the decline (-17%), compared to 1% to 2% declines in each of the other provinces. This is not surprising, given the economic impact of low oil prices and the high manufacturing dependence on Alberta oil sand activity. Although the tide has been turning, the province is still a long way from replacing all the jobs lost over the past two years. More positively, year to date sales for nearly all of Alberta's manufacturing sub-industries are above where they were a-year-ago. And as Alberta's energy sector slowly recovers, manufacturing employment is expected to pick up. Looking beyond trade with the U.S., western Canadian manufacturers have strong potential to grow new markets through free trade agreements (FTAs). For instance, in the Canada-South Korea FTA, the removal of tariffs on seafood products will be particularly helpful to the large fishing and aquaculture industries in Nunavut and BC. Meanwhile, the final ratification of the Canada-European Union Trade Agreement (CETA) will be a boon for manufacturers, as the EU potentially represents an even larger market than the U.S. To increase manufacturers'competitiveness internationally, low interest rates are making it more affordable to receive financing for capital investment. This will allow manufacturers to purchase new machinery and technology that can help improve productivity while keeping costs in check. Lower Mainland - Southwest has the largest number of manufacturing jobs of any region in Western Canada; making it the heart of BC's manufacturing industry. Manufacturing employment in that region is projected to rise 1.3% annually over the forecast period. Recovering oil sands activity will spur overall growth potential for the manufacturing industry in Alberta and Saskatchewan. This should be particularly so after FTAs come into effect. Statistics Canada. 2017. Labour Force Survey Estimates (LFS), employment by North American Industry Classification System (NAICS). CANSIM 282-0008. Ottawa. Statistics Canada. 2017. Labour Force Survey (LFS), Service Canada custom employment table by detailed industry. Ottawa. Statistics Canada. 2017. Cattle statistics, supply and disposition of cattle. CANSIM 003-0083. Ottawa. Boeing Canada. 2017. Boeing Winnipeg. (accessed November 14, 2017). Conference Board of Canada. 2017. Economic Recovery Broadens but Slower Growth in Store. Ottawa. (accessed November 7, 2017).